Bicycling and walking are both effective aerobic workouts that are suitable for people of just about any fitness level. Both types of exercise can be done indoors, on a stationary bike or treadmill, or outdoors when the weather permits. Determine the more effective choice by examining the number of calories burned during a workout with each type of exercise. Both biking and walking are low-impact exercises -- ones that do not put too much strain on your joints, hips, back and knees -- making them good choices for people with joint pain or osteoporosis. Both types of exercises burn nearly an identical number of calories, according to MayoClinic.com. A 160-pound person biking at a leisurely pace of 10 mph or less can burn 292 calories during a 60-minute workout. The same person walking at 3.5 mph would burn 277 calories per hour. Performing either exercise at a moderate pace provides a nearly identical cardiovascular benefit. The primary difference between the two is your own comfort level. 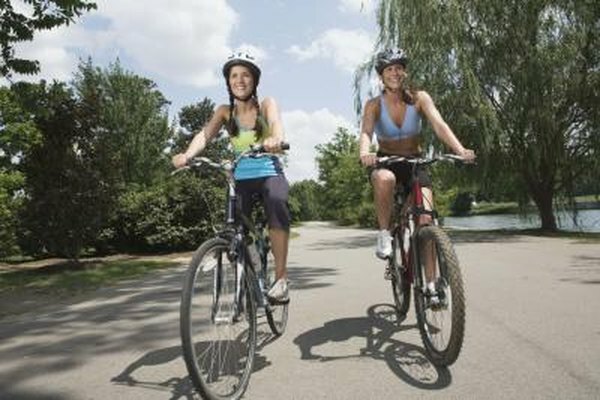 Some women find it difficult or uncomfortable to spend 30 to 60 minutes riding a bike; others experience knee or joint pain when walking. Improve your comfort level when bicycling by trying a recumbent bike; both stationary and outdoor recumbent bikes are available. These bikes put your body in a more comfortable, reclined position, with added back support. Improve your comfort while walking by using quality walking shoes that fit properly and are not worn out. The Centers for Disease Control and Prevention recommends up to 60 minutes of moderate aerobic activity per day; both walking and biking qualify in that category. The minimum recommended amount of exercise is 150 minutes total per week. For weight loss or cardiovascular health improvements, the CDC suggests 300 minutes or more each week. Talk to your doctor if you experience pain of any kind while biking or walking. In many cases, such as in women with osteoporosis, exercise will help to lessen the pain over time; however, do not start exercising for pain relief without first consulting your doctor. Intensity can have a major impact on how either form of exercise affects you. As you increase your workout intensity, you increase the rate at which your body burns calories and may also get a better workout in less time. The CDC says that 30 minutes of vigorous exercise is equal to 60 minutes of moderate exercise in terms of overall health benefits.